Feadship has launched its second new yacht of 2017, a 34.65 metre all-aluminium cruiser called CID. Created for a client who is keen to explore the bays and marinas that would be off-limits to a large Feadship yacht, CID features exterior styling by De Voogt Naval Architects. The client attended the launch in Aalsmeer on May 15, which was followed by a tour of the local Dutch canals. CID will now head out on sea trials in the North Sea and around the Wadden islands. Upon delivery, she will set sail for more exotic destinations, with the owner planning to visit the Norwegian fjords and the Mediterranean before crossing the Atlantic and spending the rest of the summer cruising the Baja California peninsula. Her calm, pale interiors are by London-based studio Bannenberg & Rowell working in collaboration with American designer Marty Lowe. Key materials include oak, walnut and wenge. CID’s large glass windows offer spectacular views from the main-deck lounge and owner's cabin, as well as the four guest suites on the lower deck. While CID will cruise with a six-person crew, the owner plans to regularly skipper the yacht. 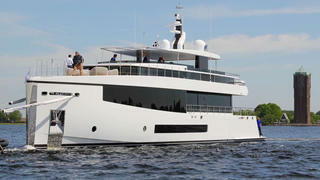 As a result, Feadship has fitted an upper helm station with a fixed Bimini providing shade from the sun. There is plenty of space on this level, as she has the largest sundeck-to-LOA ratio of any Feadship yacht to date. Designed as a social hub, the superyacht sundeck boasts an al fresco dining area with room for 16 guests, as well as a pair of reclinable sunloungers and a large pop-out TV. CID will also carry a pair of tenders to make it easier to collect guests. Power comes from a pair of MTU 16V2000 M93 engines for a top speed of 20 knots. When trimmed back to her cruising speed of 10 knots, CID will boast a maximum range of 3,300 nautical miles, thanks to a total fuel capacity of 25,400 litres. Other superyacht projects currently under development at the Dutch yard include the 110 metre flagship Hull 1007, which is due for completion in 2018.